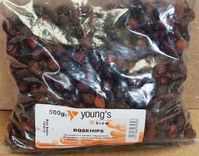 Dried Rosehips suitable for home wine making and as a healthy treat for horses. This pack of dried rosehips is suitable for use as an alternative to fresh rosehips when used as part of your recipe when making country wines. Most recipes suggest using 8oz/250g of dried rosehips with 3lb/1.5kgs of sugar to make 1gallon/4.5ltrs of wine, so this batch will make approximately 2 gallons. Rosehips are also suitable for feeding to horses as part of an overall balanced diet or as a healthy treat as they are a great source of Vitamin C and can help to improve the horse's hooves, skin and immunity levels. They are known to be an anti-inflammatory and anti-oxidant and also contain Vitamins A, E and K as well as Thiamine (B1) and Riboflavin (B2). 15-20g of rosehips per day is generally considered to be a sensible amount to give to a horse.